Husky spray guns feature stainless steel needles and precision air caps for reliability and perfect paint atomization. All Husky Spray Guns have the controls located at the rear of the gun to allow comfortable use by left and right hand operators. Husky HVLP (high volume-low pressure) technology provides high material transfer efficiency, eliminates paint waste and requires lower air volume. This Husky HVLP spray gun is ideal for high volume paint application for car refurbishing, industrial and woodwork. This gun is not suitable for use with Latex Paint. The gun is easy to clean and comes complete with a cleaning brush set and multi wrench. Gardena metal spray gun nozzle, 3 distinct different spray patterns. Continuously adjustable flow, soft plastic ring on shower head to protect from damage. Improved ergonomic fit. Gravity Feed Hvlp Spray Gun Husky spray guns feature stainless steel needles and precision air caps for reliability and perfect paint atomization. All Husky Spray Guns have the controls located at the rear of the gun to allow comfortable use by left and right hand operators. Husky HVLP (high volume-low pressure) technology provides high material transfer efficiency, eliminates paint waste and requires lower air volume. 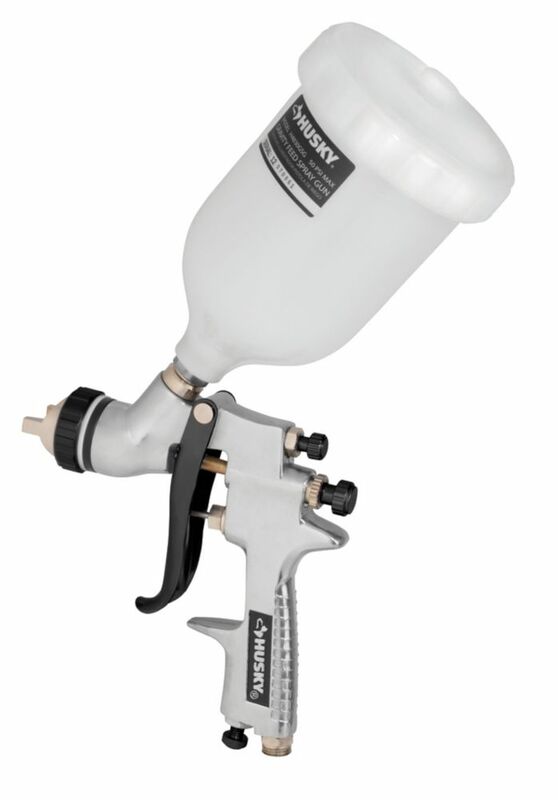 This Husky HVLP spray gun is ideal for high volume paint application for car refurbishing, industrial and woodwork. This gun is not suitable for use with Latex Paint. The gun is easy to clean and comes complete with a cleaning brush set and multi wrench.